AEM’s 4-Channel Wideband Air/Fuel UEGO Controller allows users to simultaneously monitor individual cylinder Air/Fuel Ratios (AFR) on up to four cylinders, and can monitor up to 8 individual cylinders with the addition of a second unit (up to 16 cylinders with four controllers). 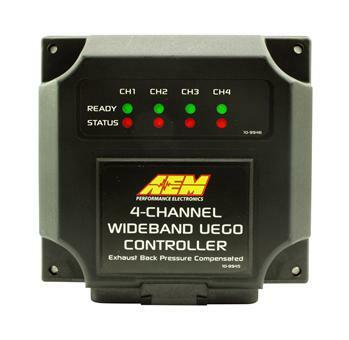 The AEM 4-Channel Wideband Air/Fuel UEGO Controller can increase both engine performance and reliability. It is the most affordable multi-channel air/fuel controller available, and is a must for anyone using an engine management system or data logger to monitor and/or tune individual cylinder AFR. Eliminate the need for averaged post-turbo AFR readings. Sensors can be mounted pre-turbo by using AEM’s optional Exhaust Back Pressure Compensation Kit (PN#30-2064). 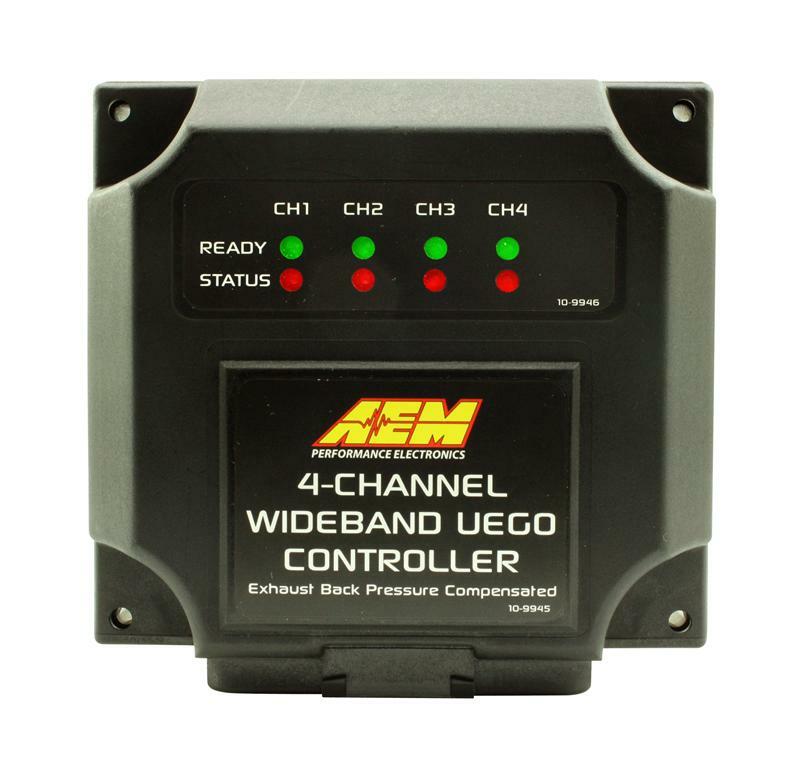 This allows AEM’s 4-Channel Wideband Air/Fuel UEGO Controller to deliver accurate AFR readings that are unaffected by pre-turbo back pressure. AEM’s 4-Channel Wideband Air/Fuel UEGO Controller uses specially-designed, stainless-steel sensor mounting bungs that help the sensors withstand the extreme temperatures of pre-turbo exhaust ports. The fins of the bung reduce the temperature of the sensor body to extend its life, and the extended bung length allows only the sensor tip to protrude into the exhaust flow to minimize flow restriction. Controller can be integrated with almost any data logger or engine management system through 4 unique differential analog outputs or the AEMnet CAN bus datastream output. The CAN bus datastream output is compatible with most programmable ECUs, data loggers, dashes and dyno systems, and provides users with the ability to data log for each individual cylinder without tying up all of the ECU’s channels. Bosch 4.2LSU sensors are laboratory calibrated at the factory. They deliver unsurpassed accuracy and NEVER require free-air calibration when used with an AEM air/fuel ratio controller. Controller includes green and red LED lights for each channel that provide immediate reference to system status or to indicate an error. The LEDs provide confidence that the system is operational and assist in troubleshooting if an error occurs. The 4-Channel Wideband Air/Fuel UEGO Controller is housed in a weather- and shock-resistant housing that repels dirt, dust and debris and is vibration resistant. Mount it virtually anywhere!